To spice up the interior, place it in the same style, and just to make the process of using a chair or stool by appointment more comfortable and enjoyable will help ordinary seat covers or seats. They can be purchased at the store and make yourself. The easiest thing to do in crochet from an old carpet. It is quite dense and soft, and therefore, no additional funds will be required. Cut from an old carpet square or circle in accordance with the shape of the seat and half the work is done! It remains only to neaten the edge of a thick thread or make them a trim of thick and wide braid that is suitable for color. For the manufacture of seat covers you can use another fabric. It is desirable that it was thick enough. It can be old jeans, coat, fabric jacket, etc. you Can make these chains as one type of fabric, or several joining together small pieces of material in the technique of patchwork. If the fabric from which you make the seats not too thick, you can add softness, sew from the wrong side a thin piece of foam. Instead of foam you can use old clothing or quilted felt lining. Can be used for the manufacture of this piece of furniture is not only a technique such as the technique of sewing, but crochet. If you have accumulated quite a large number of remnants of the thick threads, it's time to use them and link resilient seats in a rustic style. For rectangular and square surfaces as a basis you can use the scheme of the simple "Granny square", for round – to bind the circle of colored stripes. If a suitable yarn was not at hand – not a problem. You can make it yourself from old knitwear. Cut knitted items (t-shirts, etc.) into strips of a width of about 1 cm and you have a wonderful yarn for knitting! Similarly, you can make "yarn" and old denim things: the product of a "thread" will be very interesting textures due to the fact that the denim strips a little "razlohmachivayutsya" in the manufacturing process. To sit conveniently, and your products are not slid off the stools and chairs, they must be sustained. Seat square backless enough to sew on the back side elastics at the corners. If the seat is round in shape, they will be forced to make a circular band. To do this, take a strip of fabric, make it drawstring for the elastic and sew on the reverse side of the cover. For seats with backs, this method will not work. To secure seats on the chairs by using conventional ties, sewn for 2 to every corner of the product. 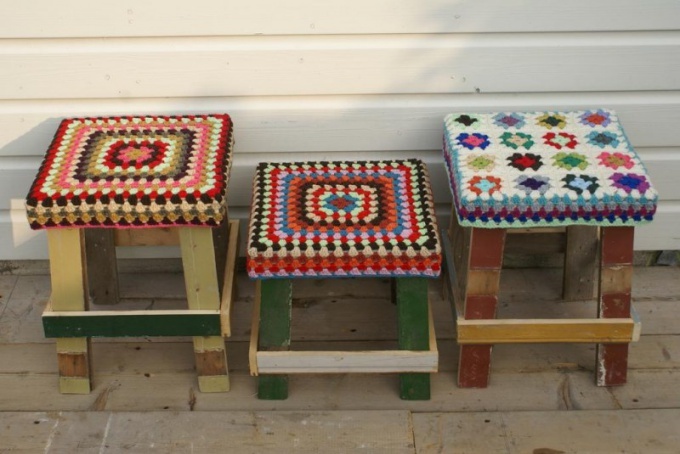 By the way, you can decorate the backs of chairs, make for them a rectangular "pillow" in the same technique as the cover for the seats. They can close the back of the chair, and only the top part of it. Stapled such cases only three sides, and then put on the back of a chair on top.